As if having “Weird Al” perform for the Closing Ceremonies on Saturday night wasn’t great enough, Blizzard Entertainment just announced that Kristian Nairn will be DJing the Blizzard 25th and Diablo 20th Anniversary Celebration on Friday night. 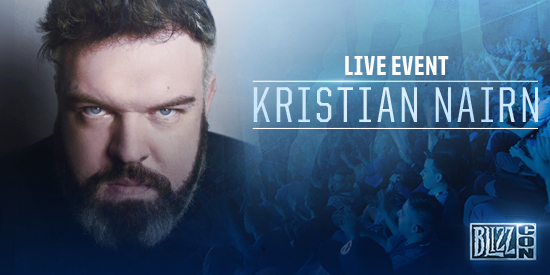 If you know Game of Thrones, then you know Kristian as the man behind fan favorite Hodor. Not only is he a great actor, but he is also an accomplished DJ. Having him drop some beats is perfect way to celebrate Blizzard and Diablo. He will be joining the festivities which include a performance from Songhammer, the winners of last year’s talent contest. In addition to live music, the celebration will also include specialty beverages and food trucks. The event is open to everyone, so you do not need a BlizzCon badge to get in. The Blizzard 25th and Diablo 20th Anniversary celebration is November 4, 2016 fro 8pm-10pm in the plaza outside of the Anaheim Convention Center. More information on the celebration can be found here. PreviousThor: Ragnarok is a Wrap with Live Video From Set and First Look at Tessa Thompson in Make-Up as Valkyrie! NextSeahawks Cornerback Richard Sherman Talks To The Press As Harry Potter!